An Arkansas-Pine Bluff football player took to social media to criticize referees who kneeled during the national anthem during a recent college football game. 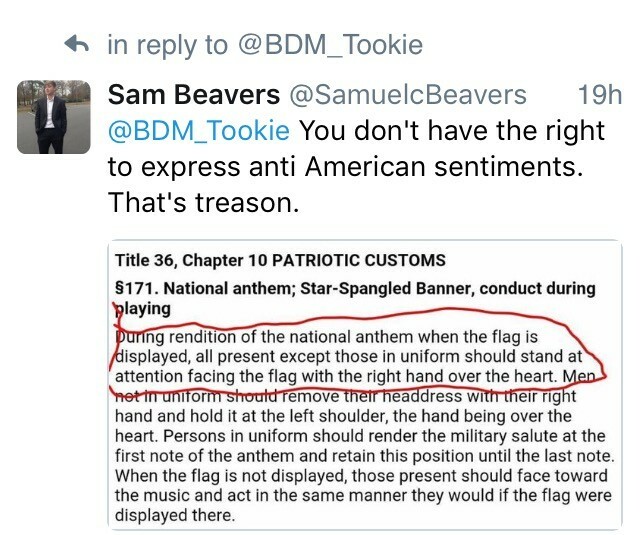 Freshman kicker Sam Beavers shared his disappointment on Twitter in reaction to a photo of two game officials deciding to kneel as the Star-Spangled Banner played prior to the start of the Virginia Union-Virginia State game on Saturday. The practice of kneeling during the national anthem made national headlines when San Francisco 49ers quarterback Colin Kaepernick decided to engage in the protest to bring awareness to the mistreatment of minorities. Since then, similar protests were conducted throughout the NFL, college, and youth sports. “If we can’t rally around the flag what can we really rally around,” said Beavers. 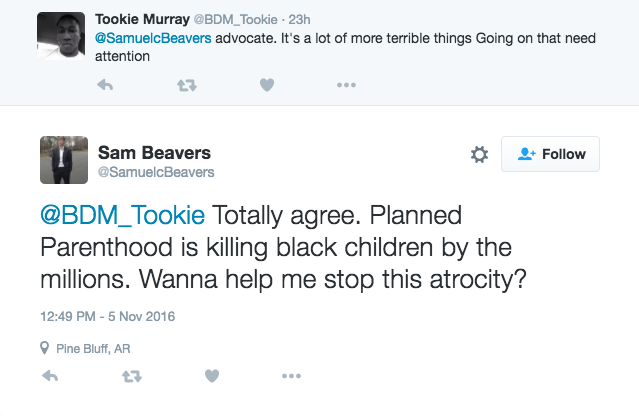 “Wanna help me stop this atrocity,” he wrote. Let me understand, white boy is considered a derogatory term directed towards an individual that disagrees with the protests and makes very valid points on why he disagrees. Also that white boy has enough testicular fortitude to stand his ground all by himself. He doesn’t require a crowd to take a stand. Don’t let the media fool you into believing your a victim, just read your response to this article and the others and you’ll see where the problem is in America!! I believe those kneeling are more by themselves that he who post on the Internet. No white boy is what he is. I’m not understanding how an individual who is BENEFITTING from a HBCU can’t understand the why of why the kneeling is occurring even though its been explained a MILLION times. YOU don’t be the victim. I’m all for marching to your own beat…but sometimes, you need to realize when you are just marching in the wrong direction for real. Enough. The refs are Americans and have the Constitutional right to freely express themselves. Personally, I wish they would stand…but they are protesting treatment people of color STILL RECEIVE in America. You want these protests to stop? Then heal the wounds and resolve the root of the problem. Attitudes like yours. This ignorance, unchristian behavior has gone on long enough. Now who is racist, really white boy. If I say black boy then I am racist, come on people get off your high horse and get along. God made men in his image, black, white brown, yellow, red. There are no yellow and red men, Hollie. When white supremacy attends an HBCU. Well if he feels that way how about he go somewhere else. Don’t bite that hand that feeds you. I agree that he does have a right to voice his opinion but when you are attending an HBCU free or charge and you cannot understand why some black people or person doesn’t stand for the national anthem is completely out of touch with reality. He doesn’t have the right to say that black people are committing TREASON just because they chose not to stand for a Slave song. If he doesn’t like what he is seeing being around he is more than welcome to attend another university or college. How is the national anthem a slavery song when it’s about us winning freedom from england? 1. Francis Scott Key, the author of the Star-Spangled Banner was a slave owner, who believed abolitionists should be put to death. 2. The third verse of the song references slaves. 3. Slaves weren’t free when the song was written. You can NOT blame us for what ancestors did. That does not mean that we are the same. That is stupid. LAND OF THE FREE AND HOME OF THE BRAVE> Not Slave song. He needs to tell Donald Trump to stop committing TREASON, not Black people. Well, Kendrick Marshall, I’m glad you feel safe behind your editing desk. God forbid your children should have to read something pro-American that they disagree with. I have used zero profanity, and kept my comments civil. Yet you use your Historically Biased power to just eliminate my comments. So this is for YOU! You are a hate-filled, anti-American, racist, bubble-wrapped, over-protected child who never had to work like your parents, and can’t face reality. You protect people who have not learned to think for themselves, and never will if you can help it. Real Black men like Booker T. Washington and Martin L. King would be ashamed to read your racist articles. They would be discouraged to see that in the 21st century, all their efforts to bring equality to the races had degenerated into an over-protected, entitlement-mentality minority class. They were both thankful to God for this country that wasn’t perfect, but provided a framework for liberty within which they could peacefully present their grievances. Both men respected the flag and anthem which represent those ideals. Both men respected the veterans and servicemen who fought to purchase their continued freedom. Both men had a vision of a better future, and worked hard to bring it about. But you and your entitlement-mentality friends just want a world that continues to protect your perceived rights to disrespect these ideals; a world in which no one can say anything that might upset your fragile sensitivities; and a world that supports you financially like a child as an expression to you of their humble apology for the rest of your life for a history you did not live through, and unfortunately learned nothing from. I never owned slaves, and you never picked cotton. Get over yourself! Here are some great, Black men you should emulate: Senator Tim Scott from SC; Sheriff David Clarke; Neurosurgeon Ben Carson; Supreme Court justice Clarence Thomas; very successful businessman, Herman Cain (Morehouse College [B.S.] and Purdue University [M.S. ]); politician and chairman of the J.C. Watts Companies, J.C. Watts; fight promoter Don King; and political activist, author, former diplomat, Alan Keyes. And you might know these most successful sports heroes: Tony Dungy, Wilt Chamberlain, Karl Malone, Lynn Swann. All good men. All conservative. No, David Carr, I am the person who did not allow that post of yours to appear. Everything you posted was fine until you decided in your very last sentence to resort to name calling. That is what prevented your comment from being posted. So “AmeriKKKa” and “white boy”, which didn’t get edited, are OK, but “disrespectful, whiny, selfish, short-sighted, racist, punk!” (not directed to any one person, but to protesters in general) isn’t tolerated. Apologies to Kendrick Marshall, author of this article and Contributing Editor for HBCU Sports. I should have known you didn’t edit the comments. The flag stands for freedom. Yours and mine! Many Union soldiers fought under that flag believing that all men should be free! Many Americans of all colors, from the North and South, East and West fought under that flag, and to that anthem, to save the world from Soviet Socialism, Nazi Fascism, Communist expansionism, and terrorism. They marched in after disasters to offer relief to people who were suffering from earthquakes, floods, hurricanes, typhoons, and other natural disasters. They’ve flown or sailed halfway around the world to provide medical emergency services and food in places like Bangladesh, West Africa (Guinea, Liberia, Sierra Leone, Senegal, Nigeria and Mali) – whether fighting Ebola or providing medicines for HIV, or vaccines for Malaria, or delivering food and water to starving children and their parents regardless of race or nationality. And many idealistic, patriotic, caring young men have given their blood, and their lives, believing that the ideals that flag and anthem stood for were worth their “last full measure of devotion”. You, however (and I only mean the “you” who this fits), can’t educate yourself enough to know that some thug didn’t really have his hands up. And instead of saying “Don’t shoot”, he slugged a police officer, had tried to grab his gun, and now was charging the officer, again. You refuse to wait until an investigation can find the whole truth, but use the chaos to loot and burn down small businesses started and run by people just trying to feed their families. You ignore the fact that when a police officer is believed to have acted illegally, or with prejudice against any race, he or she is indicted and tried according to our legal system – NOT mob rule – just as you would demand for yourself. You fail to understand that almost all police officers come into dangerous situations, often called by a terrorized neighbor, risk their lives to protect another human being regardless of race, and deserve your admiration and appreciation. You fail to think far enough ahead to see what your neighborhood or college would be like if there was no law, and no one willing to ensure that everyone abides by the same law. Shame on you for not studying and not caring about anything but yourselves. Shame on you for disrespecting your country and your fellow students. You sir are completely oblivious to reality. You will never encounter the things I, my husband, or sons will go through. Just because you can’t see it through your rose colored glasses or you are choosing to ignore what is going on doesn’t mean it doesn’t happen. You didn’t see WWI- do you believe that didn’t happen as well? The fact of the matter is you and your likes are so agitated because the minorities are pushing back and pushing back in a meaningful way. They refuse to stand up for the national anthem and I applaud them. The song needs to be replaced. It is racists. It will be replaced; it’s a matter of time. The American military needs to stay home and stay away from other people’s business. Cry all you won’t, they will continue to kneel down and won’t stand up. More power to them. Police officers, not all of them, are cowards. They have no any other skill to do any other work. They are racists and low life scums. Now don’t get me wrong, there are good cops, professional cops, but those who are murdering black people are who I am referring to. They are evil; they are angry. They fail in life and they become police officers and they release they frustration in life on the little guy, their usual historical victim, the black community. As a Canadian I’d hate to have to state the obvious but the US Flag Code quoted is basically a set of rules that have no more power than Ms. Manners etiquette. Most have no punishment (or is unenforceable), and the flag desecration has been determined to be protected freedom of expression (1st amendment) by SCOTUS. There is nothing treasonous or criminal when one fails to comply with the US Flag code. It might be against an employment agreement or contract but that is a different story. Let me get this right, when extremists from Black Lives Matter burn buildings and trash cities you cry “why can’t they protest peacefully? !” Then when someone *does* protest peacefully you cry that they should be fired. You can’t have it both ways, folks. You should have just ask how is it about slavery and not act as if you already know…ask yourself how did you come you come up with your version of what the anthem was about and you will see the error….